The year of the horse 2014 is running away from us, and it is time to welcome the New Year 2015 – the year of the sheep. It is also the time to look back at the stock market performance for the current year 2014 as well as to forecast what the New Year might bring. Before I dive into the regression analysis and ANOVA statistics, I would like to wish you happy and safe holidays full of wonderful memories and great times! May the New Year bring you happiness and prosperity! Based on the analysis and forecast described in detail further in this article, I expect the S&P 500 Index to close between 1,905 and 1,935 on December 31st, 2015. This forecast is based on the expected Gross Domestic Product (GDP) of the United States which is calculated to be between $18,187 and $18,363 billion for the year 2015. The regression used to predict the future closing price of the S&P 500 Index on December 31st, 2015: S&P500 = -1174.2624+0.1693*GDP_US. The original article published by ECNFIN on March 25th, 2013 demonstrated that historically 88.76% of performance in the S&P 500 Index could be explained by the GDP. The data used in the original article included 56 annual observations from 1957 till 2012 (ECNFIN, March 25, 2013). In this new article, I have included a smaller sample of data and focused only on the last 10 years. Smaller and recent sample of data should reflect the current structure of the economy and its influence on the stock market. By decreasing the sample size, the explanation power of GDP declined to about 50.8%. The remaining 49.2% of the performance in the S&P 500 Index is not influenced by the GDP growth. With the recent weakness of economic growth in the European Union, it is prudent to check on how much of this weakness can effect the performance of the S&P 500 Index in the US. During the first test of this paper, I look at how much the European and the US economies combined can influence the performance of the S&P 500 Index. The results of this test showed that together GDP of the US and European Union can influence 66.70% of the performance in the S&P 500 Index. Interestingly, an increase in GDP of European Union has a negative effect on the performance of the S&P 500 Index. 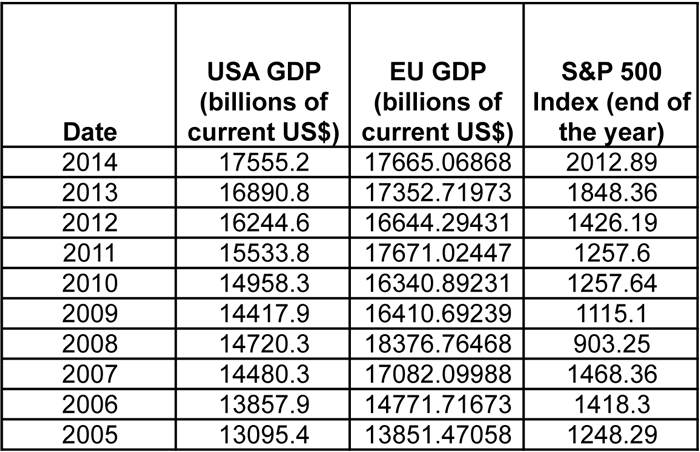 The analysis is based on the recent 10 years of data for the Gross Domestic Product of the US and the European Union (see Table 1). For the year 2014 I used estimated numbers for the annual GDP of the US and Europe Union. According to the Bureau of Economic Analysis, the current dollar GDP in the US was $17,555.2 billion in the third quarter of 2014 (November 25, 2014). According to the European Commission report, the real economic growth of the European Union is expected to be 1.3% for the year 2014 and Harmonised Index of Consumer Prices (HICP) is expected to be 0.5% for the year 2014 (European Commission, Autumn 2014). Then, I calculate an approximate GDP of the European Union for the year 2014 to be 17,352.71973*(1+0.013+0.005) = 17,665.06868 billions of current US$. It is interesting to point out that the economies of the US and European Union are almost equal is size. The S&P 500 Index closed at 2012.89 on December 17th, 2014 at the time this article was published. I assumed 2012.89 as the 2014 year end closing price for the S&P 500 Index. It is interesting to note that the increase in European GDP has a negative effect on the performance of the S&P500 Index. For $100 billion increase in GDP of the European Union, the S&P 500 Index is expected to lose 15.3 points or about 0.8%, at the current level of the S&P 500 Index. Now lets test the confidence in this regression by calculating the statistical significance of the coefficients on GDP Growth in European Union. This test shows that when combined together, GDP of the US and European Union can influence the performance of the S&P 500 Index. The null hypothesis states that the coefficient is equal to zero; and the alternative hypothesis states that the coefficient does not equal to zero. From the ANOVA table, t-Statistics for the GDP Europe is equal to -2.4875 (see Table 2). Degrees of freedom are equal to 10-3=7. The critical value for a two-tailed test with df = 7 at the 0.05 significance level is +/-2.3646. Because t-Statistics of -2.4875 is less than the critical value of -2.3646, we reject the null hypothesis and conclude that the European economy does have an effect on the performance of the S&P 500 Index. At the same time, the US GDP has much stronger influence on the performance of the S&P 500 Index. The t-Statistics for the US GDP is equal to 4.41197 which is much greater than the critical value of 2.3646. We can easily reject the null hypothesis that the coefficient on US GDP is equal to zero. The next step is to test whether the US GDP and European GDP, together, can influence the S&P500 Index. We will test the significance of the regression as a whole using F-test. The F-test for the null hypothesis that the two slope coefficients are equal to zero is 9.90494. The critical value of the F-test is 4.74, based on two slope coefficients and 7 degrees of freedom. Since the actual value of F-test is greater that the critical value, we reject the null hypothesis that the all slope coefficients are equal to zero. As the result, together the US and European GDP can help explain the performance of S&P500 Index. The second test is based on how GDP growth of the European Union independently can influence the performance of the S&P 500 Index without taking into account the US GDP growth. The results of this test show that the European economy alone does not have a significant influence on the performance of the S&P 500 Index. This also means that the test #1 maybe misleading in believing that together the GDP growth in the US and Europe can help explain performance of the S&P 500 Index. The test #2 is based on the same recent 10 years of European GDP and 10 years of the S&P 500 Index data. Based on the linear regression analysis, the level of economic growth in Europe explains only 1.28% of the performance in the S&P 500 Index (see Table 3). From the ANOVA table, t-Statistics for the GDP Europe is equal to 0.32267. Degrees of freedom are equal to 10-2=8. The critical value for a two-tailed test with df = 8 at the 0.05 significance level is 2.3060. Because t-Statistics of 0.32267 is between +/- 2.3060 of the critical values, I fail to reject the null hypothesis and conclude that the European economy by itself does not have an effect on the performance of the S&P 500 Index. By testing the entire regression, I find that it is not significant in predicting the performance of the S&P 500 Index. F-test of 0.10411 is less than its critical value of 5.32, based on one-slope coefficients and 8 degrees of freedom. Since the actual value of F-test is less that the critical value, I fail to reject the null hypothesis that the all slope coefficients are equal to zero. In conclusion, the European GDP does not have a significant effect on performance of the S&P500 Index. The third test is based on how the US GDP alone can influence the performance of the S&P 500 Index based on the most recent 10 years of data. R Square is equal to 50.81% which means that the US GDP growth can explain about 50.81% of performance in S&P500 Index (see Table 4). The t-Statistics for the US GDP is equal to 2.87463 is much greater than the critical value of 2.3060, using the significance level of 0.05. I can easily reject the null hypothesis that the coefficient on the US GDP is equal to zero. By testing the entire regression, I find that it is significant in predicting the performance of the S&P 500 Index. F-test of 8.26351 is greater than its critical value of 5.32, based on one-slope coefficients and 8 degrees of freedom. Since the actual value of F-test is greater that the critical value, we reject the null hypothesis that the all slope coefficients are equal to zero. In conclusion, the US GDP does have a significant effect on performance of the S&P500 Index. Now, since I have determined that the GDP of European Union does not influence the performance of the S&P 500 Index significantly, and only the US GDP alone is a reliable independent variable which can help explain the performance of the S&P 500 Index, I will use the final regression from the test #3 to predict the future S&P 500 Index. Before I can make a prediction for the closing price of the S&P 500 Index on December 31, 2015, I need to forecast GDP of the US for the year 2015. According to the economic projections of Federal Reserve Board Members and Federal Reserve Bank Presidents as of December 2014, the real GDP is expected to increase between 2.6 – 3.0% while personal consumption expenditure PCE is expected to increase between 1.0-1.6%. As the result, the nominal GDP is expected to increase between 3.6% and 4.6% for the year 2015 (The Fed. December 17, 2014). According to the Bureau of Economic Analysis, the current dollar GDP was $17,555.2 billion in the third quarter of 2014 (November 25, 2014). Combining the current GDP number with the projections for the next year, I can calculate expected GDP for the year 2015: $17,555.2 * (1+0.026+0.01) and $17,555.2 * (1+0.03+0.016). The expected GDP for year 2015 is between $18,187 and $18,363 billion. The S&P500 Index is expected to close between 1,905 and 1,935 at the end of the year 2015 based on the expected Gross Domestic Product (GDP) of the United States alone. Please note that the GDP alone can only explain about 50.8% of performance in the S&P 500 Index. The remaining 49.2% is not influenced by the GDP growth. The Federal Reserve Bank. (December 17, 2014). Ivan, I’ve enjoyed reading your blogs, and appreciate your thorough analysis. I’m more of a bottom-up analysis kind of person and also arrived at a decline for the SPX for 2015, although I come out at 1989 as a year-end level. Let’s hope that we are both wrong and this bull market continues (unless you are short, in which case you will be happy to be right! ).